Samsung Galaxy Y Pro Duos is the dual SIM smartphone launched by Samsung in budgets price. 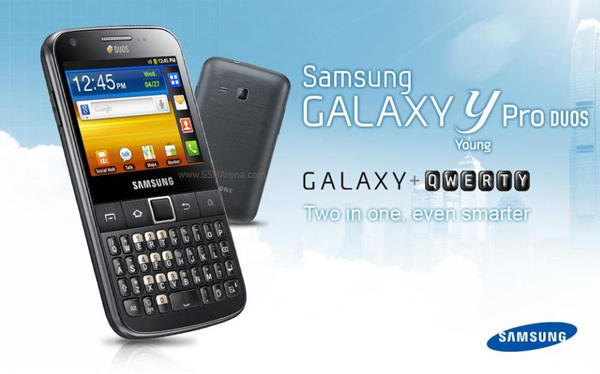 The new Samsung Galaxy Y Pro Duos dual SIM phone power is provided by Android 2.3 OS and 832 MHz processor. Samsung Galaxy Y Pro Duos will comes with 2.6 inch touchscreen display, QWERTY keyboard, 2 mega pixels camera, front camera for video calls and live chat, video player/recorder, music player, FM Radio and 3.5 mm audio jack and more. Samsung Galaxy Y Pro Duos also supports 3G, Wi-Fi, Bluetooth connectivity.